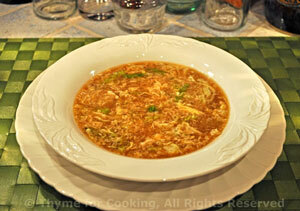 Hot and Sour Savoy Soup, Thyme for Cooking easy Chinese soups. This is a little twist on traditional Hot and Sour Soup - with the addition of slivered cabbage for a bit of texture and crunch. Thinly slice cabbage and green onions. Heat oil in a medium saucepan. Add onions, cabbage and stir-fry for 5 minutes. Stir dissolved cornstarch into the boiling stock, until thickened. Pour in egg, stir once or twice only.